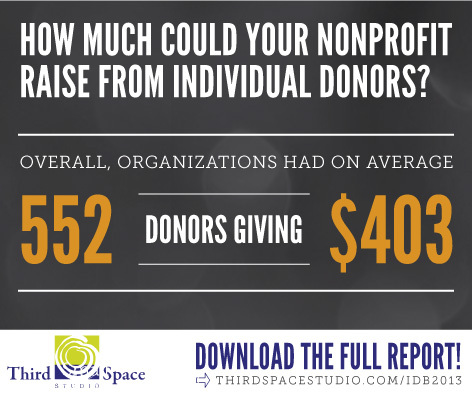 How much could your nonprofit raise from individual donors? That’s what the creators of the Individual Donor Benchmark Report sought to answer when they began a nationwide, grassroots effort to compile data that empowers small and medium nonprofit organizations to understand their donor potential and to enhance their fundraising strategies. This year, nonprofits from across the country participated in the Annual Donor Benchmark Survey, sharing their fundraising performance over the past year. The results have been compiled into a specialized report and infographic with tailored information benefitting nonprofits with a budget less than $2 million, providing an analysis of the online fundraising and advocacy community during 2013. Third Space Studio based in Durham, North Carolina collected and analyzed the survey while BC/DC Ideas, a Raleigh based communications firm, designed the report and corresponding infographic. Both organizations specialize in nonprofit strategy, communications and fundraising. Fundraisers and leaders who take the time to participate in this survey are interested in making their nonprofit more successful, moving their cause forward, and building better relationships with activists, donors and supporters. The hope is that these nonprofits, armed with data specialized for small to medium sized organizations, will feel empowered to take their fundraising to the next level of success. Click here to read the 2013 Individual Donor Benchmark Report. Click here to view the 2013 Individual Donor Benchmark Infographic. About Third Space Studios – Third Space Studio partners with nonprofits to make their work more focused and strategic. We bring more than 40 years of collective experience in the nonprofit world to bear on nonprofits of all shapes and sizes working to create real and lasting change that transforms communities and the planet. Through strategic planning, business planning, fundraising coaching, facilitation, and training, we strengthen nonprofit’s leadership, fundraising, and programs. Learn more at Thirdspacestudio.com. About BC/DC Ideas – BC/DC Ideas is an independent, full-service agency that specializes in creating meaningful communications that makes a difference. Working exclusively with nonprofits, we bring our passion for storytelling, design, fundraising and sound strategy to help our clients achieve greater impact. Our team draws on extensive experience in nonprofit and corporate communications, marketing and advertising. Our greatest joy is working with clients who want to change the world. Learn more at BCDCIdeas.com.